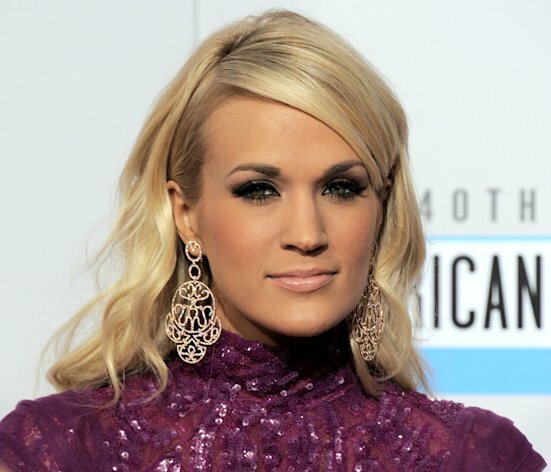 Carrie Underwood Cast As Maria In New 'Sound Of Music' - kaycee Weezy! Next year's holiday season will have televisions everywhere alive with "The Sound of Music" -- as sung by Carrie Underwood. How do you solve a problem like casting Maria, a role made so iconic by Julie Andrews, in the new NBC version of the musical? Only by tapping a singer as popular as Underwood, a country superstar and "American Idol" winner. "Speaking for everyone at NBC, we couldn't be happier to have the gifted Carrie Underwood take up the mantle of the great Maria von Trapp," said head of NBC Entertainment Robert Greenblatt. Based on a true story, "Sound of Music" revolves around Maria, a nun who becomes a governess for the seven children of widower Captain von Trapp. They fall in love, but the shadow of World War II threatens their future. Maria von Trapp "was an iconic woman who will now be played by an iconic artist," Greenblatt said. This will be Underwood's first major lead acting role; she's appeared on "How I Met Your Mother" and in the film "Soul Surfer." She isn't the only "Idol" alum to graduate to acting. Jennifer Hudson won an Oscar for her role in the movie "Dreamgirls," and will be starring on NBC's "Smash" with Katharine McPhee. Constantine Maroulis and Clay Aiken have both enjoyed stage success. And recent season contestants Paul McDonald and Jessica Sanchez appeared on "Parenthood" and "Glee," respectively. NBC's take on the Rogers and Hammerstein classic will be based on the original Broadway show, which starred Mary Martin. It will premiere sometime in the 2013 holiday season. Wonder who'll play the captain?